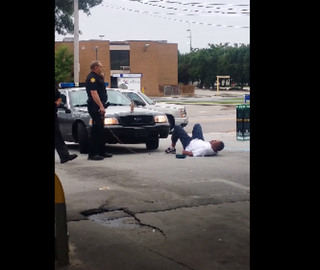 Charles James Lang Jr. lies on the ground after being tased by the unidentified deputy. A Richland County, S.C., sheriff’s deputy has been caught on video using his Taser twice on a handcuffed individual, The State reports. According to the news site, the video, which was posted to YouTube, has been turned over to Internal Affairs for investigation. Sheriff’s Department spokesman Lt. Curtis Wilson said that the man being tased was 25-year-old Charles James Lang Jr., who was reportedly arrested for disorderly conduct on Sunday at a gas station. The young man was charged with resisting arrest. “If you don’t put your face on the hood of my car, you are getting tased. Last warning,” the deputy reportedly told Lang in the video. The unidentified deputy repeatedly tells Lang, who starts to shift on the ground, not to move. When Lang tries to make a motion as if trying to sit up, the deputy tases him again. Lang can be heard screaming in pain. Wilson told The State that the deputy had followed procedure and that the department typically looks into any incident in which an officer uses a weapon, including Tasers. According to the news site, Lang’s record indicates that he has been charged in the past with tampering with a vehicle, burglary, grand larceny, safecracking, and criminal domestic violence and assault and battery. He has never been charged with violence against an officer.